The SideOut Club presented Coach George with a check for $9,000 for use by the volleyball program. Junior Vanessa King was named to the All-Big-Ten Team for 2008, capping off a season in which she hit .348, the fourth best single-season hitting percentage in school history. Natalie Emro was a unanimous selection to the All-Big-Ten Freshman Team. Along with her fourth-best-in-the-conference average of 10.6 assists per set, she ranked second among all Spartans with 71 blocks and a .275 hitting percentage. Heather McDaniel was nominated for the Big Ten Sportsmanship Award. A winner for this award is chosen from each Big Ten School at the end of the school year. "Bust Breslin" Is a Huge Success! In front of hordes of fans in the Breslin Center, the Spartans started the 2008 Big Ten season with two victories, a feat they haven't accomplished since 1996. The wins over Ohio State and Michigan put MSU, temporarily at least, in a four-way tie for first place in the conference. The crowd of 5,335 on Saturday night set a new MSU volleyball attendance record. Unfortunately, in set four of the Ohio State match, Jenilee Rathje tore her right ACL on the landing after an attack, and will be out for the rest of the year. She has been granted red-shirt status, so she will have three remaining years of eligibility. This continues a not-so-good injury record for the Spartans in Breslin. During their first match there on November 3, 1995, Jenna Wrobel sprained her ankle, which led to her missing six regular-season matches and one NCAA tournament match. During that stretch without Jenna, MSU suffered their only conference loss of the year at Wisconsin. It would have been easy for the young 2008 team to fall apart after JR's injury, but they came through to win the set and the match. Megan Schatzle stepped in and did a great job on the left side Friday night as well as Saturday, and we can look forward to seeing her for the rest of the season. The Spartan team we see this fall could be the youngest ever, with only three upperclassmen on the roster. The way the lineup is shaping up, there could potentially be as many as four freshmen on the court at certain times. 2008 will also mark the debut of our sixth starting setter in six years. These factors certainly influenced the Big Ten coaches in their eighth-place ranking for MSU in the preseason poll. The Big Ten Network will be available to most Comcast subscribers in the state of Michigan beginning August 15, 2008, just in time for volleyball season. 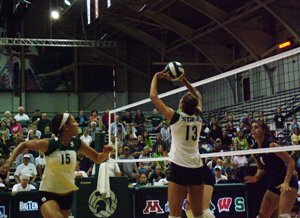 The network has 20 volleyball matches scheduled for live broadcast, including two Michigan State contests. The first will be Michigan's visit to the Breslin Center on 9/27, and the second will be the Spartans' appearance at Penn State on 10/4. In addition, ESPN2 will show MSU's October 17th visit to Minnesota two days after it is played. Please bring your family and friends, and join us on the SOC Spartan Volleyball Spectator Bus to Ann Arbor, Friday, November 14, 2008 for the 7:00 pm match against U of M. The bus will depart promptly at 4:45pm from the Okemos commuter lot located behind the Cracker Barrel restaurant on Okemos Road at I-96. The deadline to reserve your seat is Saturday November 8, 2008. Space is limited. BYO....food, beverage, and spirit! Contact Cheryl Bartholic <cbartholic@ibcp.com> with questions. MSU volleyball hopes to set a new attendance record of 5,000 or more this weekend, when they open the Big Ten season with matches against Ohio State and Michigan at the Breslin Center. The Spartans played at Breslin twice back in 1995, with almost 3,000 fans watching them beat Illinois on the way to a 19-1 Big Ten season and a trip to the Final Four. To boost attendance, MSU students will be given free admission to both matches. For Saturday's match against Michigan, there will be free T-shirts for the first 500 fans, and high school volleyball teams will get free admission. Both matches start at 6:30 p.m. and the Michigan match will be broadcast live on the Big Ten network. The Spartans travel to Mt. Pleasant on Saturday, September 20, 2008 to play the Central Michigan Chippewas. This is CMU's "Rock the Rose" promotional event, which last year brought almost 1,000 fans to Rose Arena, their largest attendance in recent years. To help MSU fans attending the 7:00 p.m. match, here are a map of the area, and a map of the athletic facilities. The MSU Spartans, sporting a 3-3 record from two weekends on the road, make their first home appearance of the season on Friday, September 12 at noon versus Wisconsin-Milwaukee. However, an unusual scheduling move has the Spartan Showcase tournament actually beginning the night before at 7 p.m., with Milwaukee-Wisconsin playing a match against Florida A&M. According to the MSU Athletic Ticket Office, season-ticket holders can gain free entrance to the Thursday-night match by showing their Friday tickets. The SideOut Club Board would like to invite all SOC members and their guests to join the Board for an exclusive preview of the 2008 MSU women's volleyball team on Monday, August 11, 2008 in Jenison Field House. Come any time between 3:30 pm and 6:30 pm to watch the team's afternoon practice. A "Meet the Team" dinner will follow the practice at approximately 6:30 pm. Another Sister? Now It's the Karaba Duo! According to the Muskegon Chronicle, Mandi Karaba will be a freshman at MSU for 2008, joining her sister Allyson on the volleyball team. This will be the third pair of sisters the Spartans have featured in the last five years. MSU Volleyball has released the fall schedule for 2008. One notable change is that the home pre-conference tournament, the MSU Showcase, has been moved to the third weekend of the season. This will be the first time since 1994 that the tournament has been held on a date other than Labor Day weekend. For the AVP event in Brooklyn on July 18, 2008, Brooke Langston picked up a new partner, her third of the year. They went on to a 13th place finish, Brooke's best of the year, and Brooke's performance got attention in, of all places, an article in the Wall Street Journal. Prior to that, the team will travel to Rolling Prairie, Indiana for a March 29th meet at the Dunes Volleyball Club [tournament schedule], to Eastern Michigan for an April 5th tournament [tournament schedule], and then will finish up April 19th at the Great Lakes Center in Aurora, Illinois. The NCAA Playing Rules Oversight Panel has approved rules changes for 2008 that include changing the term "game" to "set" and lowering the winning score from 30 to 25. Almost all other organized indoor volleyball worldwide, except for men's college play, already uses the 25-point score.